Welcome all STEM fans to another exciting school year! Allow me to introduce myself to you – I’m Mrs. Roberts, your STEM coach. This year at Ballard Elementary our theme is #TeamBallard meaning “Together Everyone Achieves More”. This is certainly no different in the STEM Lab, as science is a team effort. As you can see, I’ve gone with a classic baseball theme this year, but with a STEM twist. My baseball team is made up of all people from the past with significant contributions to STEM fields. I will be introducing you to these players throughout the year along with their achievements (and some of their failures as failure is an important part of success). Just like baseball, science is a team sport. Scientists need the support (and research) of their colleagues. Without the research and failures of others, new discoveries and advancements would not be possible. We will be practicing this same team work principle in STEM this year as we create a league community atmosphere made up of table teams. Each member of the team is a valuable player and has something to contribute. Each member of the team will have an important role to play. We will be rotating these roles each week so that all players will have a chance to experience each of the roles. Of course, our roles will have cool baseball related names, like Field Manager/Captain, Equipment Manager, Umpire, Statistician, and Referee. I’m very excited about all the great work we will be doing in STEM this year. One thing I am especially excited about for this year is happening in October. Last year I won a scholarship for STEM training for this year. I have chosen to go to Boston for a few days in October to attend the training. I will be going to the Museum of Science in Boston to participate in training in the Engineering is Elementary curriculum. This is a curriculum I’ve been using for years, and can’t wait to meet other teachers who use it, too. The training I’ve chosen to attend is on engineering for life science. We could use more challenge ideas in this area of science! I’ve never been to Boston, so this will be a wonderful experience for me, right at the start of fall in the North. I’m looking forward to seeing all the wonderful fall colors, and to be bringing more STEM experiences back to Ballard with me. Join us tomorrow night, Tuesday, August 8, 2017, beginning at 6:00 pm, for our Back to School Night. You can meet the Rainbows (Special Area) Team, and see all the exciting things we will be learning about this year in STEM. Here’s to the start of a great 2017-2018 STEM Training season! One quote I want to leave you with, Learning is not a spectator sport, so let’s play! It’s a bird! It’s a plane! It’s a Superhero! Great Scott, it’s a whole lot of superheroes! In honor of today’s superhero theme, the STEM classes were put through their own death-defying (not really, but certainly defying gravity) feats of strength and wisdom. that’s right, wisdom! I put these superheroes through tests of wits to see which superhero team was able to leap tall buildings (at least buildings made of paper and index cards). 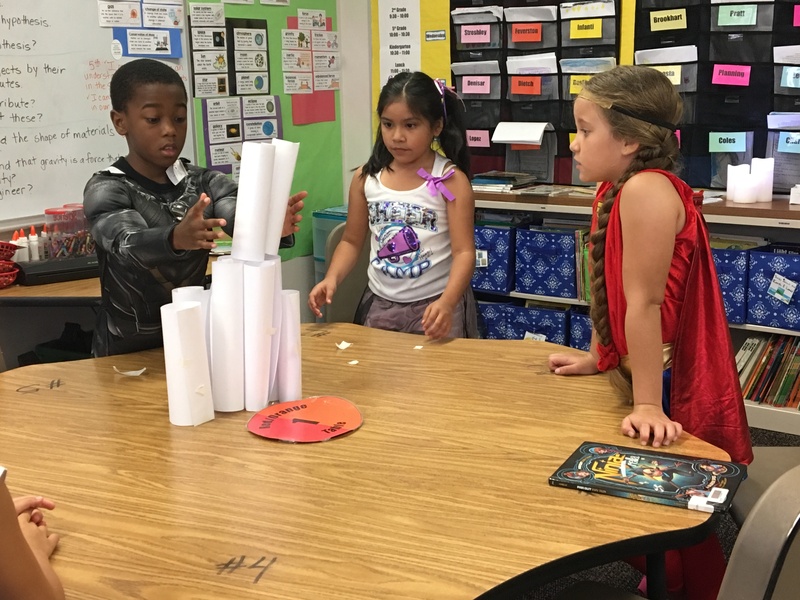 These young, but mighty superheroes were put to a gravity-defying duel of building the tallest free-standing tower with only just a little bit (12 inches) of tape in which they had to make their towers soar above all others (at least in the challenge) and not taped to the table. They were allowed to roll the paper, bend it, fold it, cut it, tear it, twist and bend it, however they needed to manipulate it, as long as it wasn’t taped to the table or lean against anything other than the paper they were given, to reach the tallest heights. 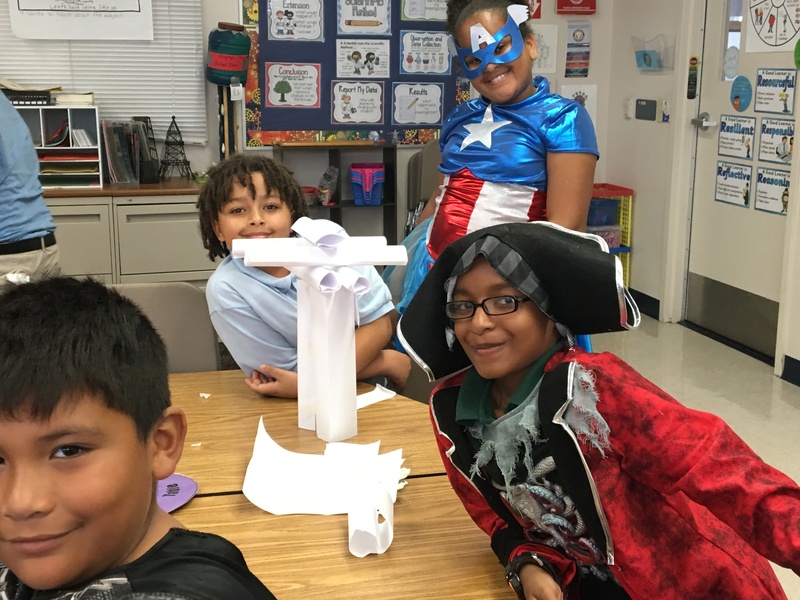 If nothing else, these superheroes had a fun day in STEM today! These young superheroes are trying to save this paper skyscraper from the brink of doom, or at least from collapse! Nothing can stop us, but gravity, from building the tallest skyscraper using just paper, and a little bit of tape, and our wits! Trying to build a super secret hide-out but these cards keep slipping through our fingers, or at least across the table! What is matter? Why does it matter? It matters because matter matters! Matter can be described as anything that has importance or is significant. Think about it – you carry a backpack with you to and from school. Sometimes it’s heavy, sometimes it is not heavy. What’s in there? One word – stuff! Stuff is what you carry around in there. But, not just any stuff! It’s YOUR STUFF! Thus, it matters! It is important to you, therefore it has significance. Matter is anything that has physical substance. Anything you can touch, feel, smell, taste, see (and sometimes cannot see) – it’s all matter. Matter is anything that takes up space and has mass. Matter is everywhere, it’s all around you. You can’t move without bumping into or stepping on matter. It’s not only stuff, it’s the stuff that makes up stuff! This week many of the classes are learning about matter, what it is, about it’s physical states, how it changes, and why matter matters. 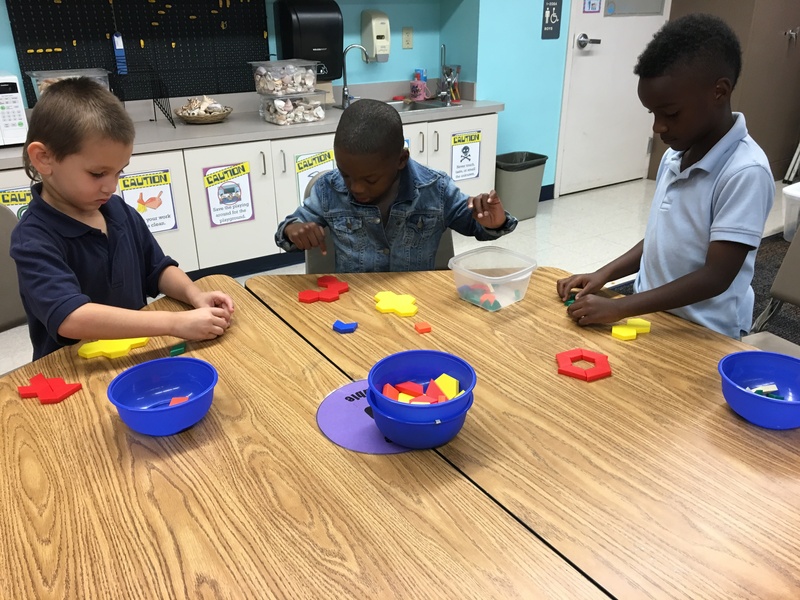 Kindergarten is learning that all matter has physical properties that can be sorted by its attributes, such as shape, size, color, texture, temperature, and weight. 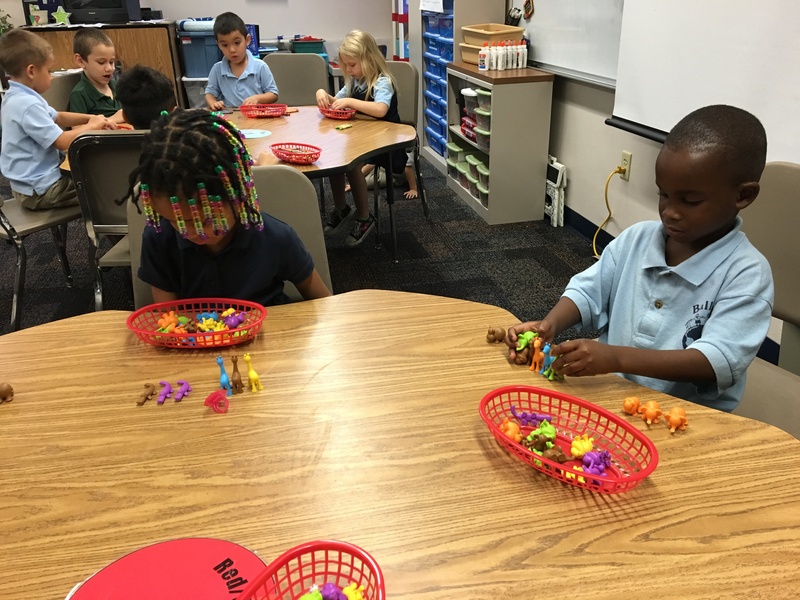 Kindergarten has been busy sorting all kinds of things by their attributes, counting, comparing (what has more, what has less), and then resorting them by another attribute. If it can be counted, it can be sorted! Every shape, every color, every size – they have sorted it all; nothing is too great, or too small to be be sorted; (Matter matters, after all!) From crayons to animals, buttons and even button holes, they are sorting and grouping. What can you sort? These students are sorting plastic counting jungle animals by colors, while others are sorting by animal kinds. 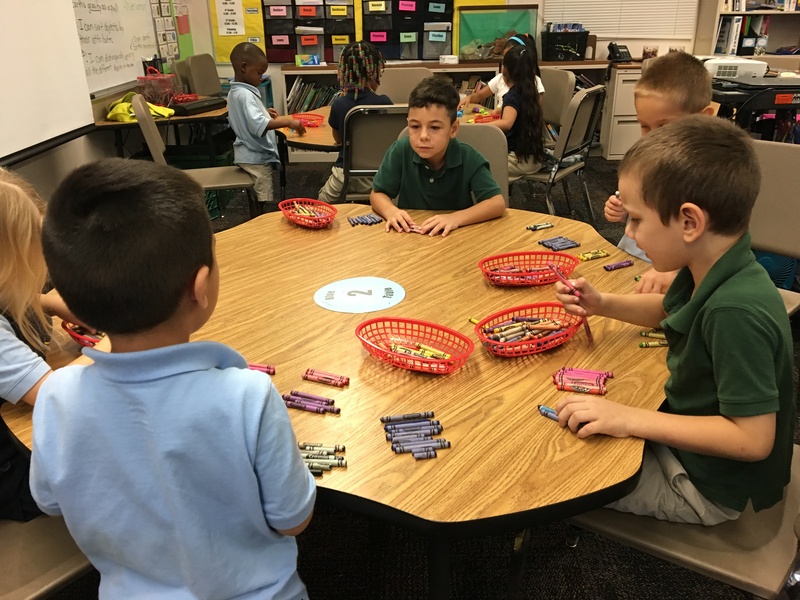 These students are sorting crayons by colors, and can visually discriminate which colors have more, which colors have less. 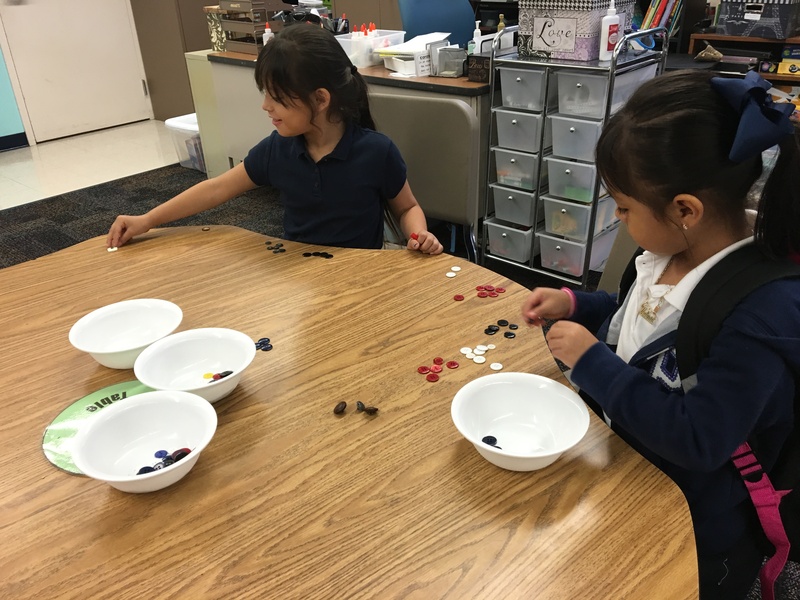 These girls are sorting the buttons by colors and finding which group has the most, which group has the least. These boys are sorting pattern blocks by shape and color together. Attention ALL 5th Graders! Do you crave more Engineering? Then I have a club for you! Join TSA for the 2016-2017 school year! 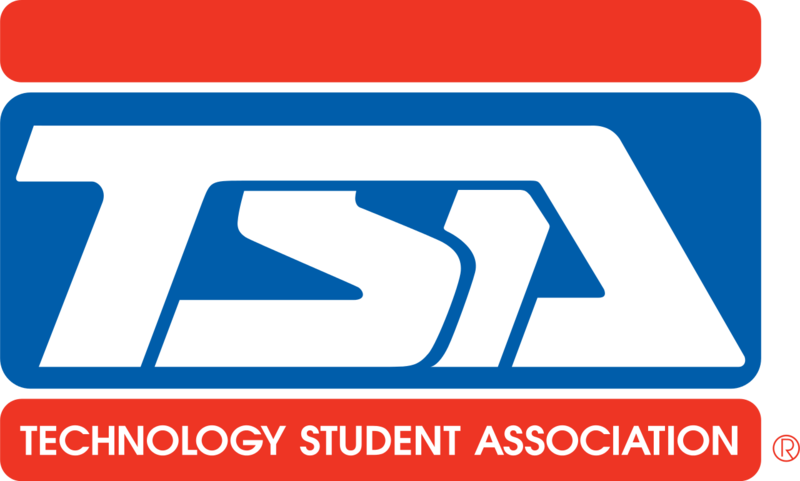 The Technology Student Association (TSA) is a national, non-profit organization for students with a strong interest in technology, open only to 5th-12th graders. Students earn the chance to apply their knowledge of Science, Technology, Engineering and Mathematics (STEM) through higher-level activities, competitive events and related programs throughout the year. Members will compete within Ballard’s TSA Organization during meetings, the District TSA Competition in December, and the Water Tower Competition later in the year. Opportunities for other competitions may also be available throughout the year. 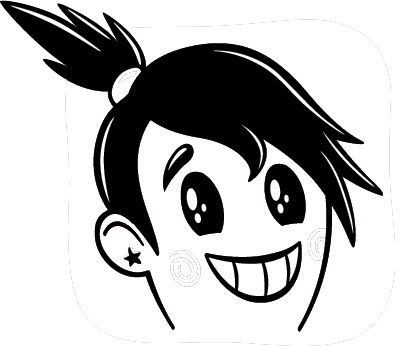 Student must be a 5th Grader and submit an application signed by his/her teacher and parent. Student must maintain a “B” average or above in class and have NO behavior issues. Cannot have more than 3 unexcused absences from the scheduled TSA meetings. Cost is $25.00 for the school year. This pays for your entrance to 2 TSA Competitions, a TSA T-Shirt, button, lunch, trophies, ribbons, medals, prizes, and consumable materials for the year. Still think you want to join TSA? See Mrs. Roberts for an application today! (All applications for consideration in Ballard’s TSA Team must be returned to Mrs. Roberts by Friday, September, 16, 2016! One game that I like to play with the intermediate students (3rd through 5th graders) is called Quiz-Quiz-Trade where each student has a card with a picture of a scientific tool on the back and the description of the tool on the front. They mingle around the room while music is played. Once the music stops, the students stop moving and go to their nearest elbow partner to match up. They listen for the directions of who is going to go first (like the person whose birthday comes first in the year), then they take turns quizzing each other about the descriptions of the scientific tools. Once they are finished quizzing each other, they thank the person for working with them, trade cards, then move on once the music has started again. Other videos about scientific tools that we will be watching include videos from Discovery Education Streaming Videos service. The 1st and 2nd Grade classes discussed our primary interactive science notebooks this week in STEM Science Class. The classes helped planned out what would be required and what they felt was acceptable goals for the highest grades in their journal entries in science. The criteria for their primary interactive science notebooks focuses more on writing skills than the intermediate/3rd through 5th grade notebooks as they are still learning the writing process. Both 1st and 2nd grade classes decided they wanted each area to have a maximum of 2-points if they met the criteria in the rubric, while 2nd grade Agents of Science added in a section for recording their observations from their science experiments and investigations. 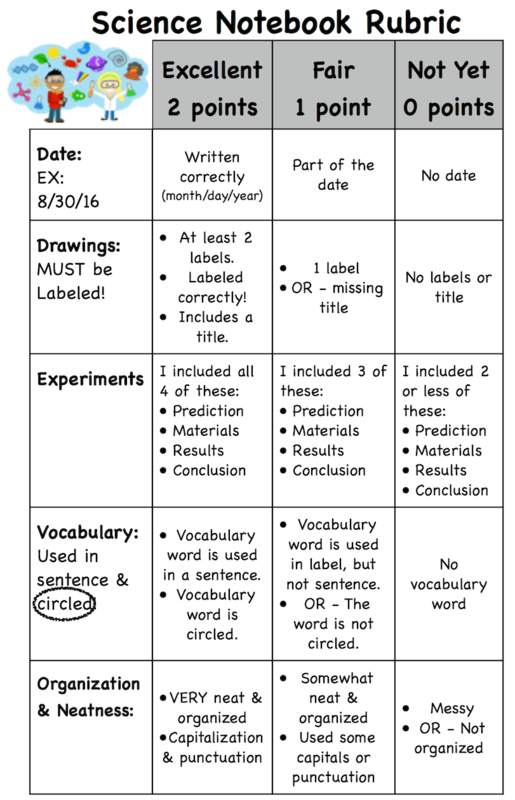 Second grade Agents of Science will also be introduced to a Table of Contents this year in STEM so that they understand its purpose and how to keep track of their interactive science notebook entries. However, they will not be graded on the Table of Contents until the 4th Quarter as they are preparing to move up to 3rd grade. Each of the classes were given copies of the rubrics to glue inside the back covers of their primary interactive science notebooks next to their quarterly grading page. I’ve mentioned in other posts about the requirement for keeping interactive science notebooks. This week in my STEM Science classes I will be going over what is expected in our interactive science notebooks and how they are expected to be organized. I will be showing the classes, especially 3rd through 5th grade classes a visual rubric of how I will be grading their interactive science notebooks each quarter. 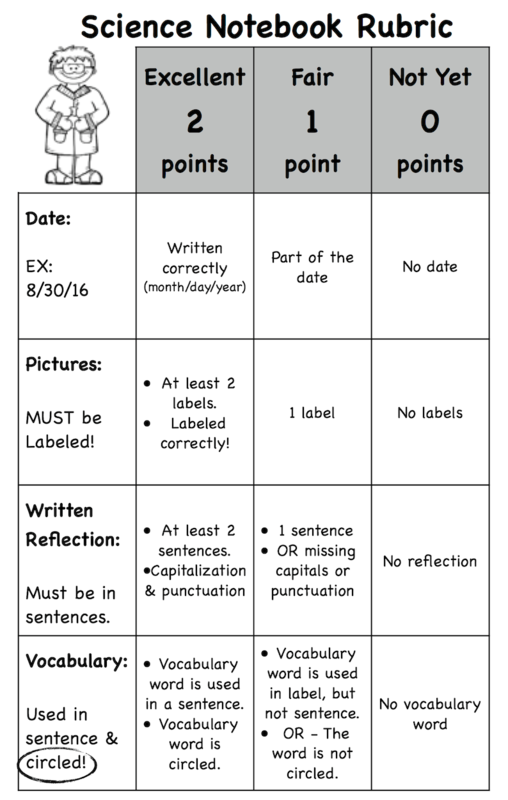 First and Second Grade classes will be helping me set up and decide upon their grading rubric and the kinds of things that I will be expecting in their notebook. Legible! If I can’t read it, I won’t grade it! 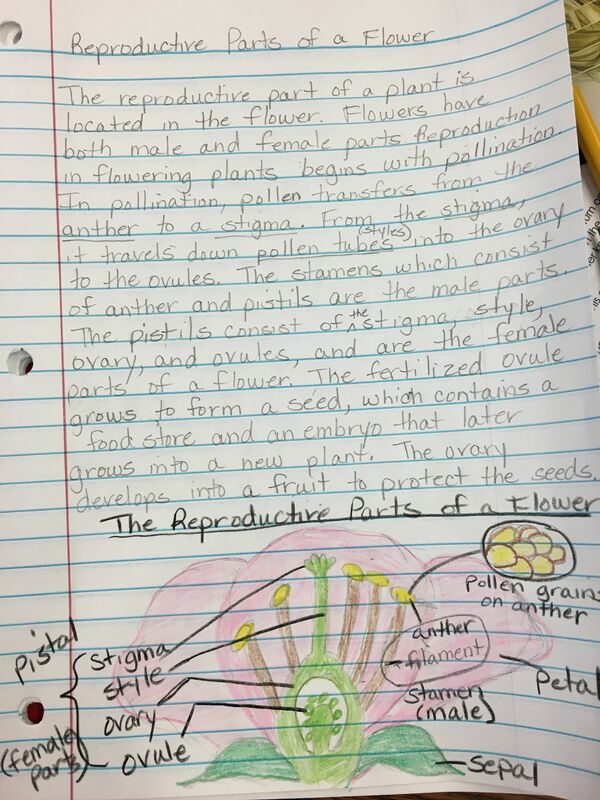 This interactive science notebook entry for the reproductive parts of a flower is worth 1 point out of 4 points. It is worth only 1 point because the entry is missing the page number, date, and page title. There are misspellings in the entry, flower reproduction has been spelled as “flowr reprodukshun”. (Important words will be spelled out on the board and in the word wall for Agents of Science for reference.) The flower drawing is very basic and does not show the reproductive parts of the flower. The parts of the plant are not labeled, nor are the reproductive parts of the flower. And although the drawing was done in marker with purple and green, the picture is pretty much uncolored. Also, there is no reflection to support the learning for this entry. 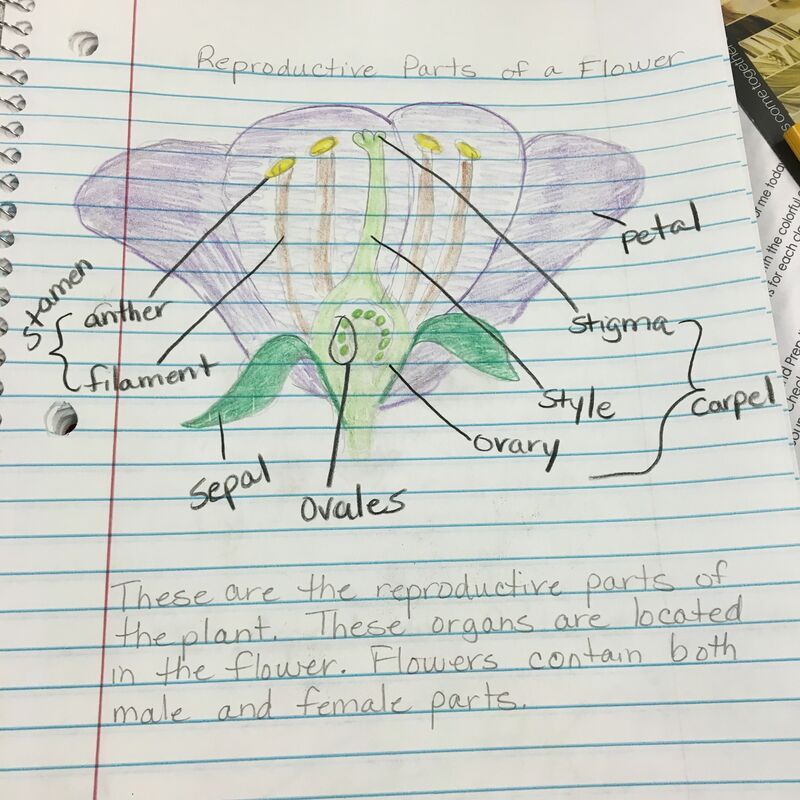 This interactive science notebook entry for the reproductive parts of a flower is worth 2 points out of 4 points. It is a little more detailed than the last entry. The page has a page number (9) and a title, “Flower Reprodukshen”, spelled incorrectly. The diagram is colored, however, the diagram is missing some reproductive parts, only very basic parts are shown, and most of the labels are missing. The diagram also needs to have its own title. There is a reflection, but the reflection is simple with one sentence. This does not show a complete understanding of the concept being taught. 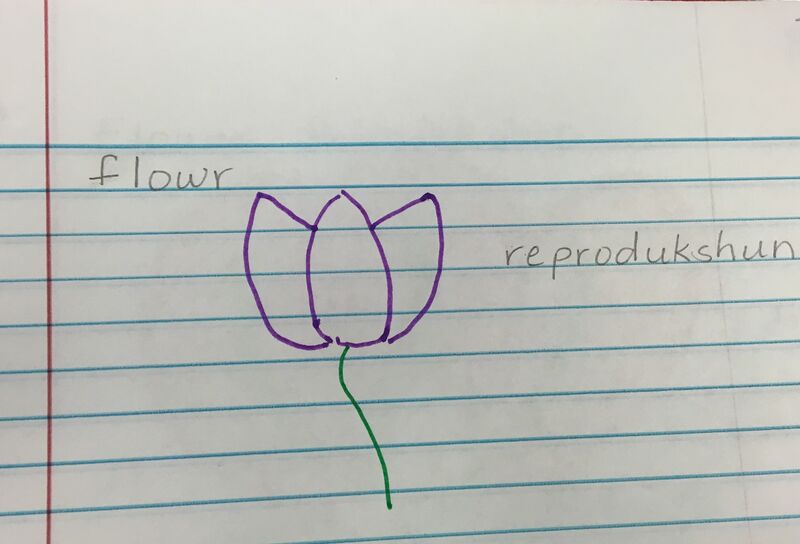 This interactive science notebook entry for the reproductive parts of a flower is worth 3 points out of 4 points. Now, some of you may be saying, but Mrs. Roberts, this looks pretty complete. Why only 3 points out of 4 points? 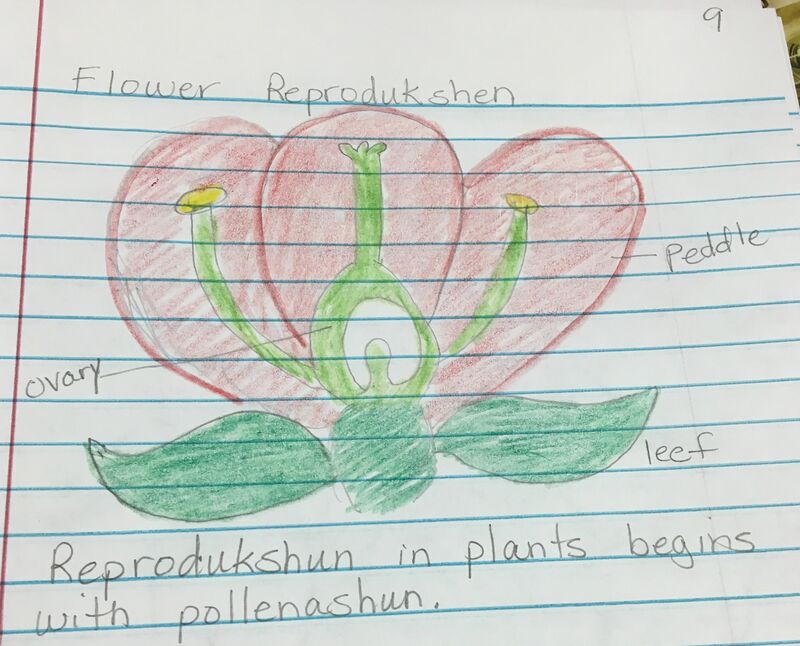 Items missing from this entry that is keeping it from a 4 are: the date, separate title for the diagram, and a THOROUGH reflection explaining in detail how the reproductive parts of the flower work. The reflection include does show an understanding of the reproductive parts of the flower, but does not explain how it all works. THIS is what a 4-point out of 4 possible points entry in the interactive science notebook looks like, especially for 4th and 5th grade students. There is a date (albeit, not included in the photo), page title, page number (also not included in the photo), a thorough explanation about the reproductive parts of a flower, with corrections neatly made using a single line through the mistake, a very thorough diagram including inserts/closeup of the pollen, everything is labeled, and the diagram has its own title. The entry is neat and colorful, and is completely legible. Also, if I were to check the Table of Contents (TOC), there is a listing in the TOC for this page with the date and page number. In keeping with the school wide theme “Mission Possible” this year, students in my classroom will be “Agents of Science“. Students in my classroom are expected to behave following the school wide PBS Expectations of “Be Safe”, “Be Respecful“, and “Be Responsible“. All three of these are extremely pertinent in a science classroom where we will be doing many hands-on experiments and STEM building challenges. Often, we will be working with things that can hurt students if they are used improperly. No, this does not mean they will be working with hazardous waste or toxic materials! But, let’s face it, even a pencil can do harm if used incorrectly! So, what do the Ballard PBS Expectations look like in my classroom? Use walking feet (especially coming up and down the stairs). When it is your turn to speak, speak in a manner that shows you care. Handle materials and classroom items with care. Agents of Science will also be expected to keep an interactive science notebook which will be provided to them. These notebooks will be used to keep daily notes, reflect on scientific concepts being taught, record results from experiments and investigations, brainstorm ideas for STEM challenges, and draw blueprint designs for challenges. Students will be working in groups of 4 or 5 most of the time during experiments or STEM challenges. 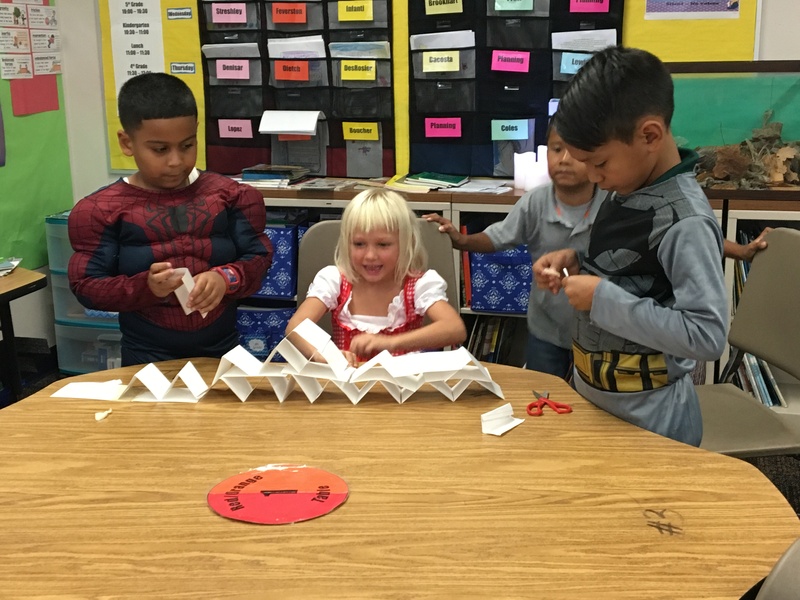 Occasionally, they may work in smaller groups of 2-3 students, depending on the amount of supplies available, when working on a design challenge. This is so that they are able to have more hands-on contact with the materials, and so that each student will have the opportunity to take home at least one thing they have created in my class this year as a result of their teamwork. Agents of Science can also earn Class Dojo points for following all classroom expectations and for exhibiting Class Dojo character traits for the month. Classes will also earn a Rainbow Spirit ticket in Class Dojo for following all classroom expectations. Welcome to Mrs. Roberts’ STEM Science Class! Welcome to Mrs. Roberts’ STEM Science Class at Ballard Elementary! I’m Mrs. Roberts and am so excited to be here this year teaching STEM Science. This is my first year teaching at Ballard Elementary, although I did my intern teaching here in 5th Grade many, many years ago. It’s good to see some familiar faces among the teaching staff, some of whom I worked with when I interned teaching 5th grade Math and Science. I am so happy to be here teaching Science to everyone. Science is my absolute favorite subject. I also love being able to teach science in a hands-on project-based type of class like we will have this year. I know that last year the students enjoyed the Engineering Classes that Mrs. Huston taught, and may be wondering why Science, or why you cannot just simply play with the LEGOs like you did last year. This year, the admin has asked me to go back to focusing on the science standards, however, I also love teaching engineering, so I will try to integrate some STEM challenges into the lessons as they pertain to the particular science-based unit we are working on. Just to give everyone a little background about who I am and where I am from, I have a strong background in STEM, that is science, technology, engineering, and math. I previously taught at a small elementary charter school in Manatee County where I have been for the last three years. Last year, I served as the school’s technology specialist, testing coordinator, and gifted teacher, as well as teaching STEAM (that’s STEM with an emphasis in Art) as a special area class to Kindergarten through 5th grade students. For part of the year, I also subbed teaching math and science to 5th grade students. Before then, I taught math and science to 4th and 5th grade students, while having a 4th grade home room class and working closely with the 5th grade home room teacher. I also taught all subjects to my 4th grade class my first year there. Before going to the charter school I taught technology classes at Braden River Elementary School where I started their Elementary Engineering program, and served as the school’s technology coordinator for three years. I’ve also worked at Mills Elementary and Palmetto Elementary among my 17 years in Manatee County. This is the first year in a long while where I didn’t have the added responsibilities of technology coordinator, so I will be able to focus more on what I really love, just teaching hands-on science. (This is also one of the first times I have not had computers in my room. I hope this changes over the course of the year!) Besides teaching science at Ballard, I will also be advising the 5th grade Technology Student Association (TSA). This is an organization that I am very passionate about and have been affiliated with for many years. We are very blessed to have TSA at the elementary level in Manatee County. This is normally a technical organization for middle school and high school students around the nation, but here we have it open to 5th graders. TSA is a technical organization for students to learn more about engineering design and technology, where they can compete against other students their age in competitions in science, technology, engineering, math, and business, while having fun. Middle school and high school students can compete at the district, state, national, and international levels, while elementary students in Manatee County compete against students from other school in Manatee County. We have competitions in catapults, fruits and veggies design, and model water towers. We also have other opportunities to join other local competitions in engineering design such as toothpick and balsa wood bridge building competitions at some of the different engineering expos. When I am not teaching or leading students in TSA activities, I am married to my favorite geek who is very supportive of me being a STEM teacher by helping with me technology and robotics. I am also the mother of three (nearly grown) children. I have two children who just moved to Orlando this fall, a daughter who is attending the University of Central Florida (which makes me a UCF Knights mom; Go Knights!) and my oldest son who will be attending Valencia Community College (transferring from SCF here in town) and then plans on transferring to UCF in the Spring. My youngest son attends Southeast High School (Go ‘Noles!) where he is active in the marching band and other music classes. I am looking forward to teaching STEM Science at Ballard Elementary School and joining the Ballard family! (I already feel very much at home at Ballard as this is where my father attended school many, many years ago.) I hope to be sharing many posts this year about the wonderful, exciting things our students are learning and creating in my class. Please bookmark this page and check back often for more posts. I will also be creating a Twitter account to share updates from class.